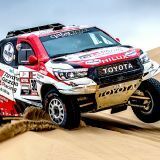 Qatari Nasser Al Attiyah has won the 2019 Dakar Rally driving a South African-built Gazoo Racing Toyota Hilux, while two South African champions, Ross Branch (KTM) and Kenny Gilbert (Husqvarna) took an emphatic 1-2 in the motorcycle rookie race. The race run exclusively in Peru this year ended with Al Attiyah cruising home to wrap up an emphatic third Dakar victory, his third for three different carmakers, as Carlos Sainz (Mini) fought off Sebastian Loeb (Peugeot) and Cyril Despres (Mini) to win an almost academic final stage. Al Attiyah won the race by 46 minutes over Spaniard Nani Roma’s Mini, with rally legend Sebastien Loeb third from the Minis of Pole Jakub Przygonski and Frenchman Cyril Despres, Martin Prokop's Ford, Saudi Yazeed Al Rajhi and Czech Boris Garfulic's Minis and SA hero Giniel de Villiers’ Toyota in ninth. The motorcycle race went down to the wire as Aussie Toby Price (KTM), Chilean Pablo Quintanilla (Husqvarna) and Austrian Matthias Walkner (KTM) set off last and in reverse order and split by six minutes in the overall standings, but Quintanilla tumbled early on to lose time as he pressed on hurt as Price escaped up front to take the day and the overall win — his second Dakar victory in five starts and an incredible 18th Dakar motorcycle win for KTM. Teammates Walkner and Brit Sam Sunderland wound up second and third ahead of Husqvarna duo Quintanilla and US youngster Andrew Short, Frenchman Xavier de Soultrait’s Yamaha and Chilean Honda rider Jose Flormino. 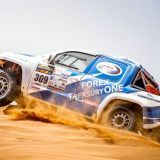 Russia’s Eduard Nikolaiev’s Kamaz took the truck win, Argentine Nicolas Cavigliasso totally dominated the quad race and Chilean Chaleco Lopez Contardo took side-by side honours, but the headline story is without doubt the South African success story. Team principal Glynn Hall has finally achieved his long-held dream of winning the Dakar. Hall first attacked the epic race with his SA-built Nissans before switching to Toyota in 2012. 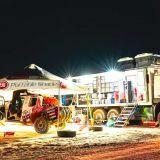 The often under-funded Toyota team has also remained unfancied in an international sense, but it has long delivered Dakar podiums as the team worked tirelessly towards its objective finally achieved in Peru in 2019. Dakar’s first South African hero was a biker — Alfie Cox flew the flag brilliantly in the late ‘90s and early new millennium, taking a trio of podiums, but there have been few serious SA Dakar two wheeler attempts since. 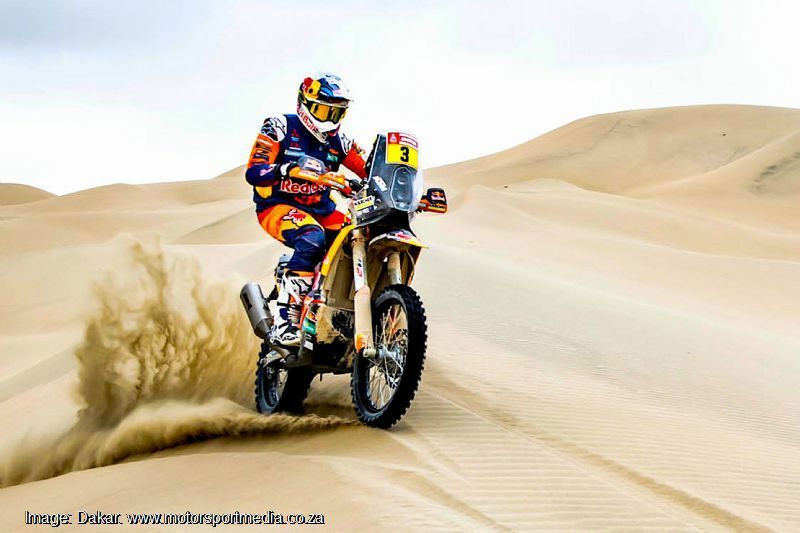 Ross Branch and Kenny Gilbert have changed all that, SA’s cross country motorcycle racing frontrunners went to Dakar with humble objectives but both return home with that Dakar rookie 1-2 and a couple of top-20 finishes in 13th and 19th respectively. 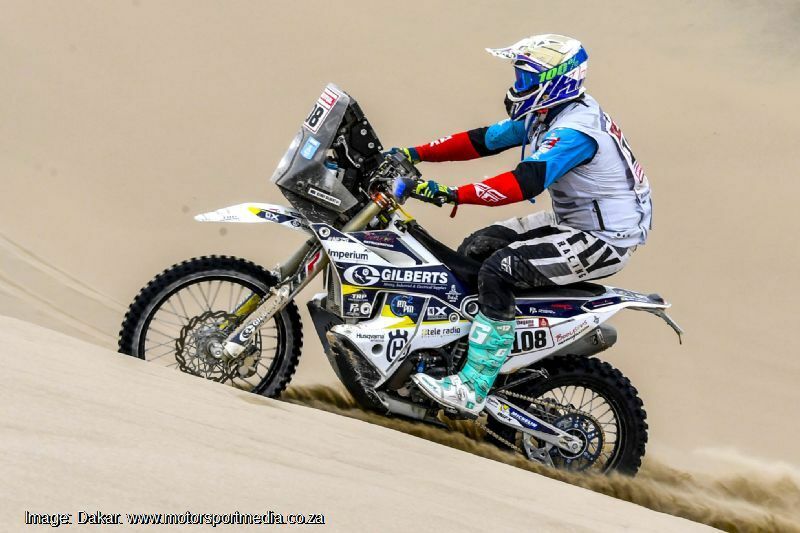 Multiple former South African Cross Country Moto champion but a Dakar rookie, Pretoria’s Kenny Gilbert started the week in 42nd on his Husqvarna before moving steadily up the leaderboard on his Husqvarna to end up 25th overall and third of the bike rookies by Saturday’s rest day. Kenny continued to make up places through week 2 to wind up a stunning 19th overall and second amongst the rookies. 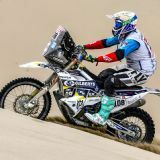 Gilbert’s arch-rival on home soil, Botswana’s reigning SA champion Ross Branch was another to star on his Dakar debut aboard his KTM. Branch climbed the leaderboard to sit 22nd by Friday before moving up to 17th on Saturday to take the rookie lead into the rest day. Ross then picked up a position a day through the second week to start Thursday’s final stage in 13th overall en route to that motorcycle rookie victory. 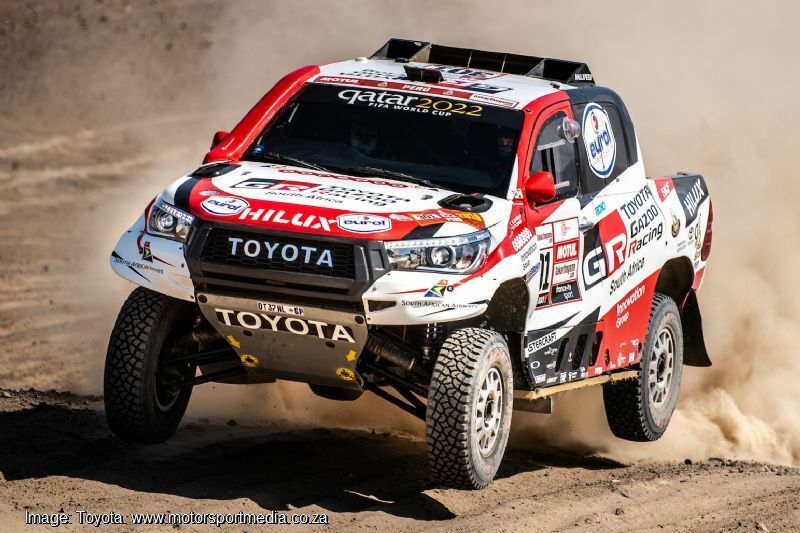 Dakar legend Giniel de Villiers was leading the cars on Day 2, but the Gazoo Toyota Hilux ace hit a rock and lost several hours on Wednesday and then lost more time assisting teammate Ten Brink on Thursday to start Friday 40th. 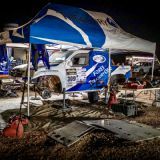 Undeterred, the former Dakar winner fought back to end up ninth in a consistent fightback to add to a stunning Dakar record. His Proudly South African team Toyota teammate Nasser Al Attiyah meanwhile finally brought Dakar glory to Toyota. 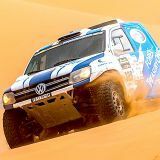 Another South African to earn a Dakar 2019 finisher’s prize was truck crew member Sean Berriman, who raced alongside Germans, driver Mathias Beringher and Stefan Henken in a MAN as part of South Racing’s fast response team. 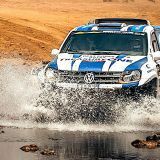 The trio enjoyed a positive race in between emergency servicing their teammates to come in 12th overall among the behemoths. 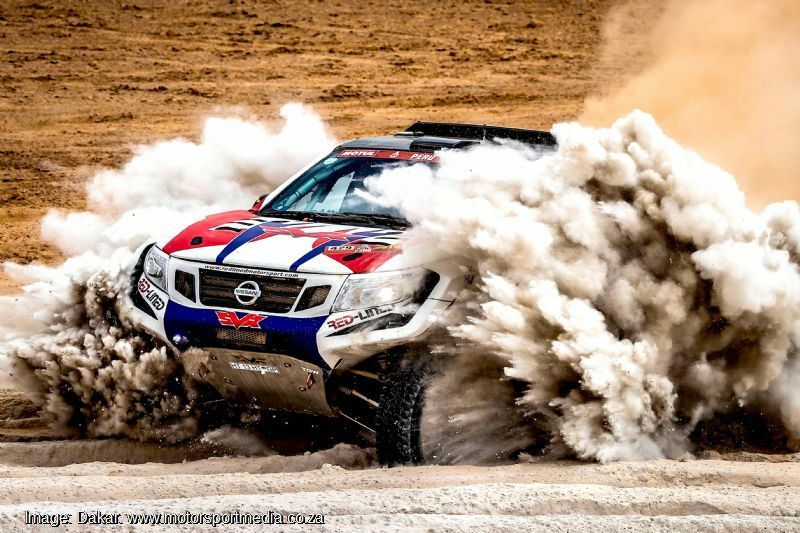 Two other South African entries starred in the Dakar, but did not make the finish — car rookies and the first SA team of colour to tackle the epic race, Shameer Variawa and Zaheer Bodhanya enjoyed a Dakar baptism of fire, arriving in Peru with a brand new SA developed Red Lined Nissan Navara and zero dune driving experience. 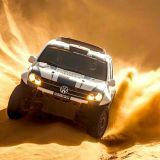 They nonetheless acquitted themselves well, but struggled to overcome a low starting position on a dusty and difficult Dakar. ’The Overtakers’ spent much of the first week moving up the field each morning only to be thwarted by another problem in the afternoon and do it all over again the next day, often racing into the dark and the crew working through the night. Their efforts were finally thwarted when the Navara hit a hidden rock in visibility, severely hampered by a combination of fog and fesh fesh dust to force its retirement on day 8. They will be back! 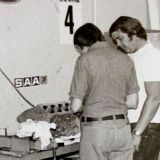 Another SA competitor to show ultimate grit was Original class bike racer Stuart Gregory, who raced without any service assistance out of a trunk containing all his spares and tools carried from stage to stage in a truck, quietly and effectively progressed day by day. 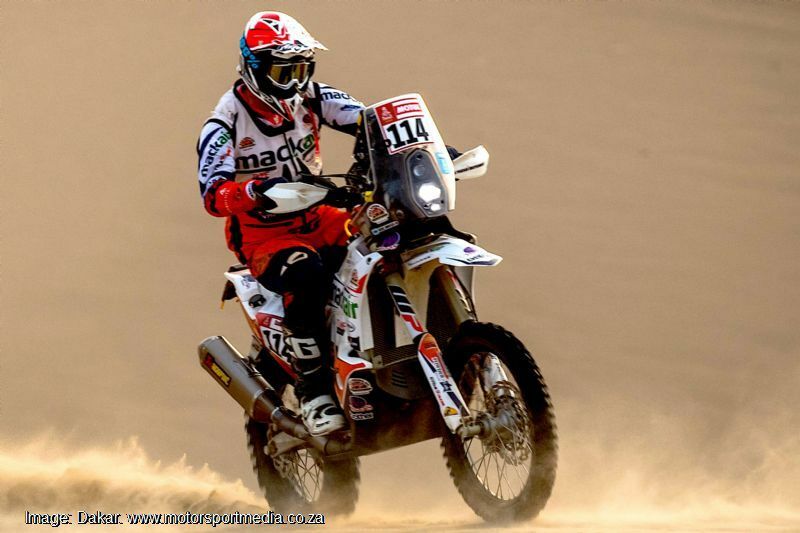 The Port Edward KZN adventurer’s Dakar came to an end on Tuesday, when he suffered the despair of an engine failure on his KTM to end a stirring debut effort. 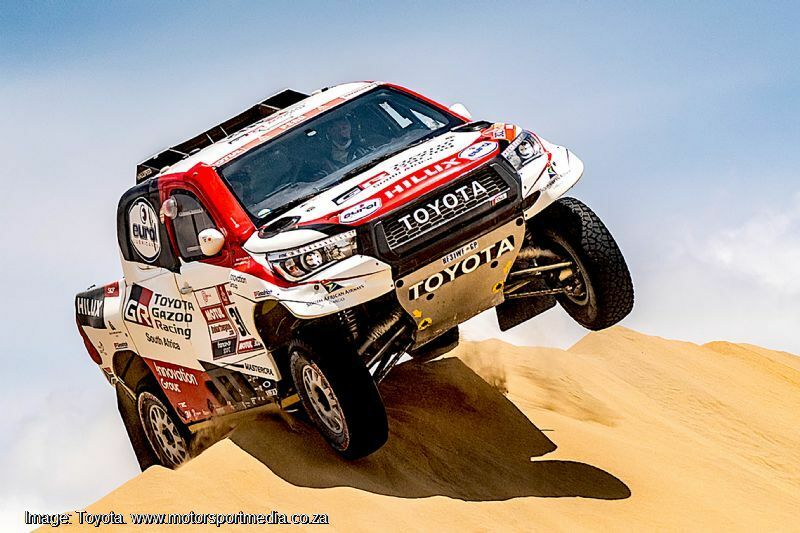 DAKAR IN REVIEW — CARS — TOYOTA AT LAST! 334 machines came under starter’s orders in Lima Monday 7 January, setting off on a short blast down the Pacific coast to Pisco, 102 of them being cars and it was Attiyah who struck while the iron is hot beating the Minis Sainz and Przygonski to Pisco. Rally legend Sebastien Loeb’s Peugeot delivered a crushing performance to win the 342km second day to San Juan de Marcona from Roma and Bernard Ten Brinke and Giniel de Villiers’ Toyotas as de Villiers moved into the overall lead over Ten Brinke, while French Dakar legend Stephane Peterhansel lost 20 minutes and Al Attiyah appeared to struggle for pace. Russia’s Eduard Nikolaiev’s Kamaz led the 41 truck starters over the first week, beaten only on Wednesday by teammate Andrey Karginov day 3, but Karginov was later disqualified for not stopping after bumping a spectator. 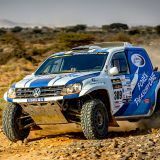 Week 2 saw a busy week as Gerhard de Rooy fought back in his Iveco to win a couple of stages before Nikolaiev lost an hour Tuesday as teammate and countryman Dimitry Sotnikov took the day to move into the overall lead, but Nikolaive bounced back Wednesday to take a 58 second lead into the final day over Sotnikov.